It’s slow going to fix up your house unless you’ve got a fat purse and a lot of time. Sometimes I feel like I’m buried in the bureaucracy of life admin. Sign an online petition and your email inbox mushrooms with doomsday scenarios. Buy something online and you are attacked daily by 20% off coupons. We now have digital clutter to clear and speak with robots on the phone. We recently put another dent in the slow moving entryway project. What happens to me is that when we make an improvement, I exhale and exclaim “it looks great”. And so we live with the partially finished project while absorbed in work to put food on the table and tend to our family and friendships. After the blue venetian plaster work and the teardrop chandeliers went up, I was happy opening the front door and walking into my house for awhile. Then the novelty of the last phase wore off and so it was time for the next. The doors leading to the girl’s room and the bathroom were filmsy hollow doors. I never liked them. I like the feeling of opening and closing a solid wood door. I shopped around for wooden doors and they were too extravagant for my purse. In New York City, we have a great resource. Build it Green! NYC is a recycling project, a place where contractors can donate excess stuff from construction/renovation projects and others can buy it. I snapped up the two paneled wooden doors for 60 bucks! Then we got molding to frame the new doors with. That was always the vision, a posh entryway with elegant molding. As my friend Linda says “molding brings the eye up and up and up”. It gives the illusion of higher ceilings, a welcome thing in a narrow hallway. What’s next? Molding along the juncture of the plaster wall and the ceiling and a good looking and useful spot for hanging up coats and setting down boots now that winter is almost upon us. 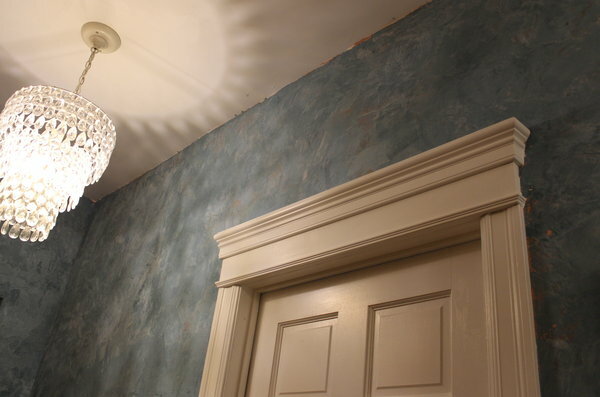 This entry was posted in our homesteading history, our revamping and home design and tagged doorway molding, entryway design, entryway renovation by ileana. Bookmark the permalink. Your friend is right, again. 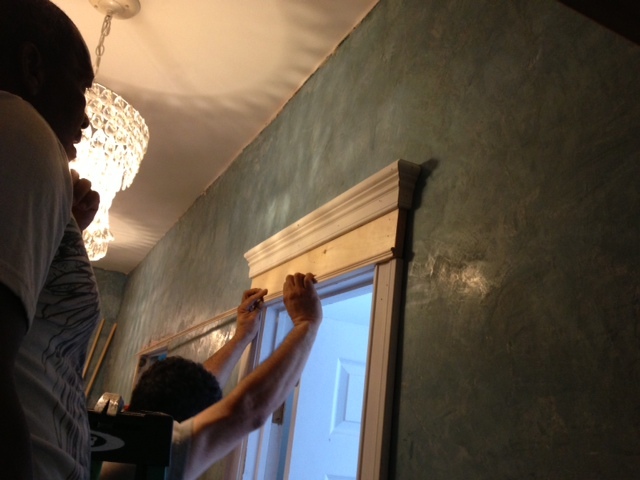 Crown moldings and trim are your friend in a small space! Already looks better.